Our mobile chart carousel racks are ideal for hospital and long term care chart storage at the nurses station. Designed to hold a maximum of thirty (30) 1 1/2" - 2" open top or side open chart binders. Organizers can be repositioned to store larger binders. 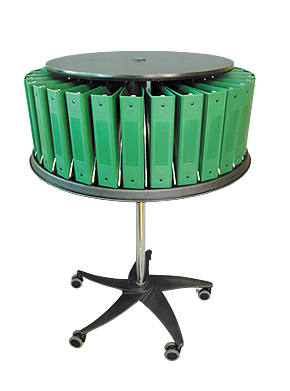 Single tier rotates independently 360 degrees. Floor standing model. Dimensions: 49 1/2" H X 36" W X 36" D.